Dimensions: 5.5" X 8.5" X 1"
William Cobbett was born in 1763 at Surrey, England. An author, farmer and journalist, he yearned for something more than his simple country life could afford, and became intimately familiar with the English language while enlisted with Nova Scotia. Noted for his efforts which served as a preamble to the Reform Bill of 1832, as well as for his aversion to authority and novelty, Mr. Cobbett is most famous for his Rural Rides, which was printed in 1830. 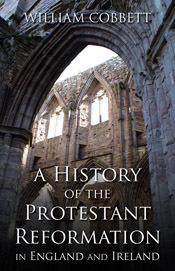 He also composed A History of the Protestant Reformation in England and Ireland, which amounts to a thrilling and accurate portrayal of the untold disasters of the times during the Reform. He died on the eighteenth of June, 1835, at the age of seventy-two.